Conflict largely is and has always been part of all human endeavours, however one particular area where conflict has created problems has been land conflict where tribes owing to their beliefs and cultures feel that lands they occupy has been a heritage property that had been handed down from generation. Land remains an important natural capital for every nation and individuals, and because of this, it is not unusual that there is land conflict across the world, especially in developing nations like Ghana where a huge population depends on agriculture for their livelihood. A case of a protracted land conflict in Ghana is between the people of Nkonya. and Alavanyo. 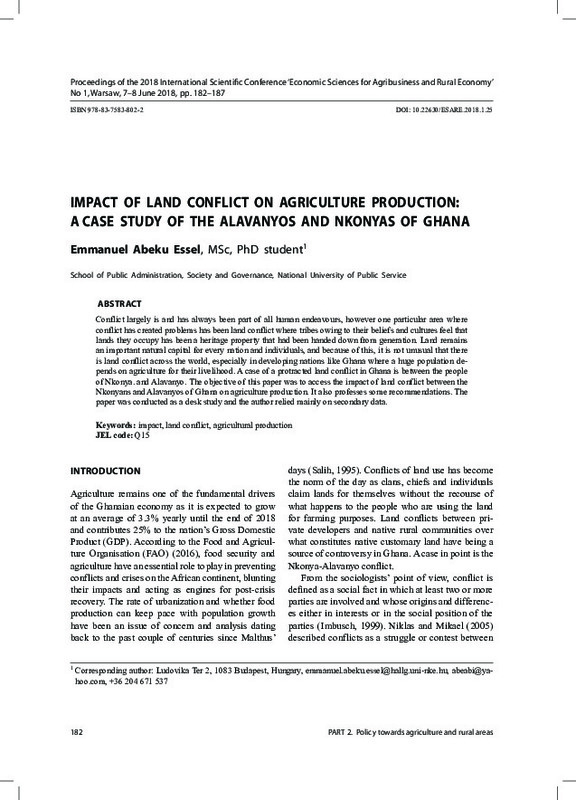 The objective of this paper was to access the impact of land conflict between the Nkonyans and Alavanyos of Ghana on agriculture production. It also professes some recommendations. The paper was conducted as a desk study and the author relied mainly on secondary data.